How many times I have been wanting to go to the salon but I always fail to do so bec. I have to many reasons. Sometimes I have no time, sometimes I feel lazy or sometimes I forgot about it and one time I was already scheduled like last Sunday but typhoon Frank got in the way. But hey, I finally went to my favorite neighborhood salon yesterday afternoon after watching the boxing match of Pacquiao and Diaz on TV. I got there 330pm but was only served at about 430pm bec. they have many customers at that time. I didn't want to leave bec. that is where i always have may hair done. Anyway, i got a haircolor, hair spa and a hair cut. My grey hairs are all appearing again so I need to cover them up hehehe. It was a relaxing and refreshing afternoon for me at the salon and I feel my hair is so light and soft. Imagine I have been sitting in the chair for 3 hours for my hair treatment. 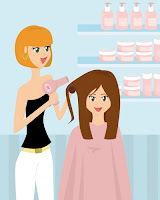 What about you have you been to the salon lately? Ok I confess I am not a domestic diva. I do some household chores but I really hate the ironing task and every other week a laundry woman comes to our house to wash our clothes. I also find the bathroom plus it’s bathroom fixtures hard to clean and maintain but there are OC individuals who can keep it sparkling clean. Aside from that, kitchen is also a must kept clean area in the house. Those are the often used areas in most homes. I just salute all moms who can do a lot tasks in the house with flying colors. I know it is not easy to maintain a home esp. if you have kids who keeps on making a mess after you have cleaned. And for those working moms who still can uphold the neatness in their house even if they are working, I reckon they are incredibly great. Imagine juggling 2 hard jobs at the same time? Just remember mom, don’t forget to treat yourselves once in a while. Hooorayyy, our very own Manny "Pac Man" Pacquiao, knocked down Mexican David Diaz, yesterday morning, (Sat. evening US time) during the boxing match. The fight was held at Mandalay in Las Vegas. 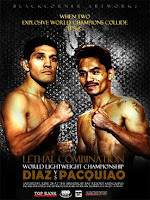 Pacman grabbed Diaz' WBC Lightweight belt in a 9 round grueling match. The Mexican was bruised and has cut on his face and went down on his knees before falling face down. Ouuchhhh.. I even watch the delayed telecast on channel 7 eventhough it has many commercials. I really wanted to see how he knocked down this Mexican. Manny made our country proud again bec. of this and now he also made history bec. he already won 4 titles in different weight categories. He is also the 1st ASIAN to have won this title. He is sure good !!!! I’ve been back home for over 2 months now and I dearly miss my vacation back in OZ land. The best days are when we spent 1 week in an Island and even went snorkeling at the Great Barrier Reef. Ahhh what a pure bliss that is! We also stayed at one of apartments there and we also had a chance to stay at the hotels in the city when I was about to go home. Summer is gone in OZ land and how I was I still there. meanwhile in America, summer is there and for sure many are already thinking of having a vacation. It is always nice to stay in nice hotels like reno hotels in Nevada, and somewhere else. I also dreamed of going to the US as I have lots of relatives there from my dad’s side. 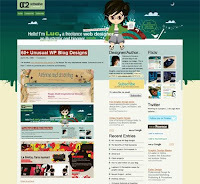 Ok I have been a little bit busy these days updating my other blogs and surfing for some good finds online. I am just amazed on how vast the internet was and there are actually a lot of products and goods that are awaiting to be sold . If you love shopping like me then you can find lots of interesting stuff on my fashion blog. If you have time you pls. browse it. Next year, our highschool batch '84 we'll be having our SILVER Alumni Homecoming (25 yrs). Wow that is a long time ago huh! I reckon you can already guess my age at this point hehe. Anyway, I am quite excited since I was not able to attend our 21st reunion in 2005 and I hope this time I can make it. Our batchmates were all busy preparing and hunting all our former classmates so that it will be a memorable one. I in turn made a forum so we can discuss things about the reunion. We are still discussing the date, place and other details. Hopefully it will turn out so good. It was so nice to see some of my classmates giving ideas and exchanging hi's and hello's. I am just so glad that i have been moderating all the comments here on my blog bec. there are some jerk individuals who would only comment just for the sake of getting a backlink from me (I'm a Do follower) or just to advertise their products/services. And just today, one attempted to put a comment but it was a copy paste of what is written on my last post. Do you think i will approve that? NO WAY.. lol. People are sometimes crazy you know. I love receiving comments from my visitors but when it is senseless I don't like it. Just to let you know I will not approve any comments like that or with comments like " Wow" "Nice", "Great", Good Post etc. This is my blog so I have every right to ban, delete and approve comments. 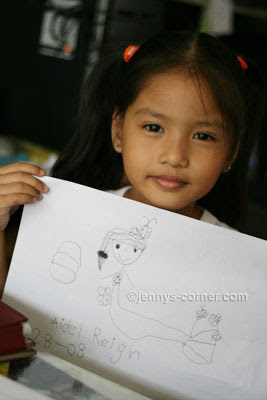 This is Reign, my 5-yr. old niece who loves to draw. I am not surprise anymore since artists really runs in our family if I can brag here a little bit. Her dad learned how to draw (not stick people) at age 2 and he passes on this love for drawing on his daughter. When Reign is in the mood, she'll grab pen and paper or her favorite magic board and she'll start drawing something created by her imagination or things she sees on TV or every day life. Here, she sat beside me and started to draw and when I turned around I was so amazed and glad of what she created. She drew a mermaid and when I asked her who it was she said it was DYESEBEL, a local mermaid and a fiction character now being shown on TV(CH7). It was so cute bec. 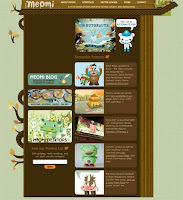 take a look at the tail it has flowers as decors and cute butterfly on the head. And look at those long eyelashes hahaha... I will be sharing more of her works here if I can bec. I am one proud tita (aunt). I got tagged by Liz.. Thanks! Finally, my Australian vacation photos were already printed last Thursday!! I only chose 900 pics from among the nearly 3,000 photos that I have to be printed. I was really looking for a store that gave me a discount in printing and thanks to Buge my co-dgiscrapper who recommended FANS Digital store in Quiapo. It only costs P5.00 per print of 4"x6" size and I was able to save a lot since the regular price here in our place is about P7.50. It was timing that my bro. will go to Quiapo that Thurs. so I asked him to have it printed. The prints were ok but there are few that they adjusted the colors so much that it turned out to be too bright, wish they never did that. Anyway, the only problem is that I need albums for my pictures. Actually I already have 2 albums that I bought in Australia but i left it there when I came home last April bec. I was already over baggage. Well, at least my family already saw my OZ pics. Been surfing the net since this morning hoping to find some good inspiration for the new header that I wanted that will replace this current header of mine. As you all know I have an artistic nephew and niece that can help me make am illustration. 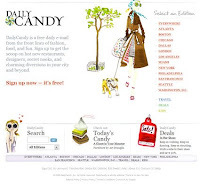 Anyway as I was browsing online, I stumbled upon Vandely's lists of 25 Incredibly Artistic Websites and I was amazed how beautiful were the original illustrations of the web owners. How I wish I am as talented as they are. Here are my personal pick among the 25. And take a look at the photo, I already have wrinkles beside my eyes, a sure sign of ageing but I don’t worry much about that and would not think of using anti wrinkle cream at this moment. My laugh lines are also visible now but I hope I will age gracefully. But with all that flaws, I still feel beautiful ! For non-digital scrappers, i don't know if they appreciate all the layouts that I have been sharing here. But for my co-digiscrappers, every layout that we make are really special because we put a lot of effort, time and patience in making them. Sometimes one layout can take us up to 5 hours or so or even days to finish it depending on how elaborate a layout. layouts can be printed just in case you didn't know. Anyway, this is a very nice hobby if may ask, so if you are not a digi scrapper yet, better start learning now and make some layouts that you'll cherish for a life time. That is what I told to my friend who has recently joined the blogging bandwagon. I have influenced her when she saw me writing stuff here on my blog and in no time I thought her some tips on making her own. With a little patience and perseverance she and I have been making little extra on our online works and who will not be so thankful for that? We are so grateful bec. we can now put a little bit (or more) on our savings accounts that when emergency comes we have something to get. I know nothing is permanent and things or jobs will slowly become scarce bec. of the heavy influx of bloggers in the recent months. PR also contributes to get more jobs and bloggers all know that. Right now I don’t have that but I am still thankful that I still have work from time to time while my bestfriend got lots of works that sometimes she has no time to do them. I told her to grab, write while the iron is hot since this will not stay forever. Today we are celebrating our 110th Independence Day. This morning Pres. Arroyo went to the flag ceremony and wreath laying at Luneta Park where her cabinet members and thousands of people gathered to witness it. Meanwhile, VP Noli De Castro was the one who headed the same ceremony at Kawit, Cavite where our flag was 1st raised after being independent. There are also job fairs, art exhibits and other fun activities going near Luneta Park. Things are pretty slow for me here, work (online) wise so to keep me busy and sane I have made 2 new layouts last week that I think is pretty cool. I like the way they came out and I was more inspired to scrap again this week, but of course I hope i'll have more opps to come. 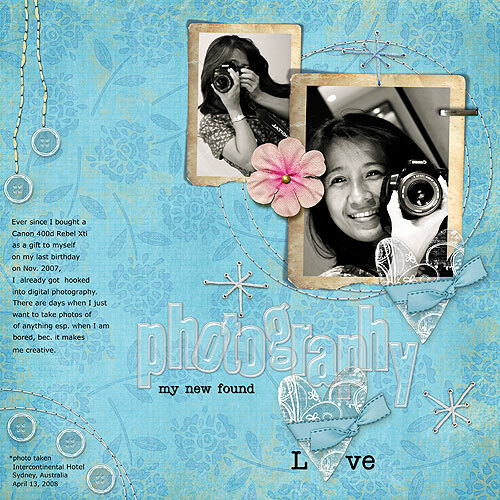 "Photography, My New Found Love"
Buge inspired me to do this layout bec. of her great extractions on her layouts. While doing this layout, my nephew saw this and told me to put wings and so I did and I love the way it turned out. For non- scrappers I suggest you try your hand in digital scrapping as it can be therapeutic and a hard habit or hobby to break and it is fun. 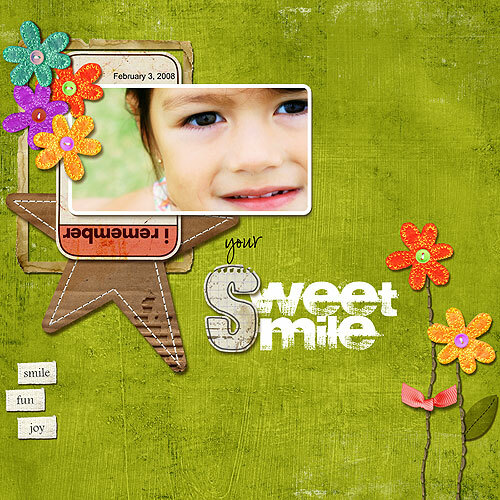 You can print your layouts 8x8 or 12x12 inches whichever you prepare. Today is the start of the school year 2008-2009 and thousands of students (including my nephews and nieces0 in private and public schools already attended their classes. All clad with new school supplies and or new set of uniforms, they happily went to school to learn new things. Once again parents will wake up early to prepare foods for their children. 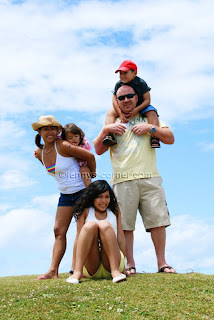 Vacation is over, kids should devote their time and energy now in studying. I remember when I was in elementary and highschool i was always excited to got to school not only bec. i have new things and to learn but to see my old teachers and school mates as well. Geezzz, what is happening at my MS Word lately? Every time I try to open a document it will freeze and my documents folder is always EMPTY !!! Yikes, but when I search it using the Control Panel all my documents were all intact. Oh no, probably i need to re-install the program, will do that later though. I was in my super emote day last week, so this inspired me to make another layout for the album that I am making for myself. And after 6 months of not scrapping finally I am making layouts in the last 3 days and you can see them at my FLICKR photos too. I can say that I don’t have the perfect bill of health but I am proud to say that I have not been confined to a hospital for a disease or any ailment. Health is wealth as they always say and we always thrive that in our life bec. getting sick is really hard not just physically but financial as well. Oh boy, I reckon as we grow older, aches and pains will be part of us no matter what and just recently I have been getting uncomfortable bec. my left leg is always aching and I suspect bec. of my varicose veins. My veins are somewhat big and swollen (runs in the family) due to too much sitting where my blood has a hard time circulating. When I go to sleep I make it a point to stack pillows underneath my legs but last night it was just painful. Aside from that I also have a very sensitive stomach which I find it very annoying almost all the time. My relatives already know about this and I am not sure if I will have it examined at this point. Oh well, eventhough I have been experiencing it at least I am not yet drinking any medicine or supplements like liver cleanse or anything. Oh know this reminds me of the recent death of Rudy Fernandez just last week and that we really never can tell when our life will end. Oh by the way, I am playing badminton, 1/2 or an hour almost everyday. I was browsing for some opportunities to write for my blogs just few minutes ago and I can't help but to laugh and ask if that advertiser is crazy ...lol . I have been meaning to digital scrap for a long time now but for some reason there's no urge or inspiration that is coming into my brain. Luckily after downloading the freebie Naturally kit by Bren Boon, i got inspired so browsed my photo archives and started to make a layout. My co-bebots (dig-iscrappers) too gave me a boost to scrap again and I was so happy to make one layout eventhough that is so simple. I know this will be the start of my scrapping days again. Yay thanks the scrapping spell has broken.. I'm sharing this layout and hope I can scrap more. Oh by the way, this is my 1ST TIME to scrap using PSCS3 bec. 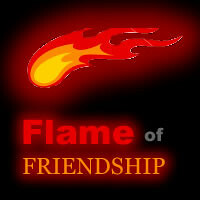 I have been scrapping at PSP8 and I have to tell yah psp8 is more user friendly. Wow it's June already and time sure flies so fast eh. 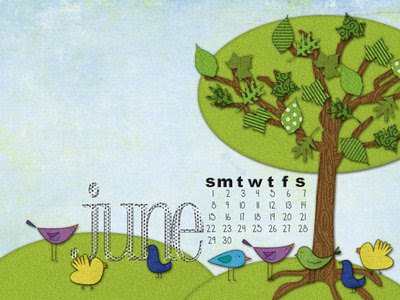 Bren Boone has this June Desktop that is FREE to download at her blog and is available in 2 sizes. A nice way to decorate your desktop this month. Ahhhh The birdies are just so cute. Grab it now ! I haven't scrap for i think 6 months already since I got back home I have many attempts to make one but my effort becomes futile. It is quite frustrating bec. 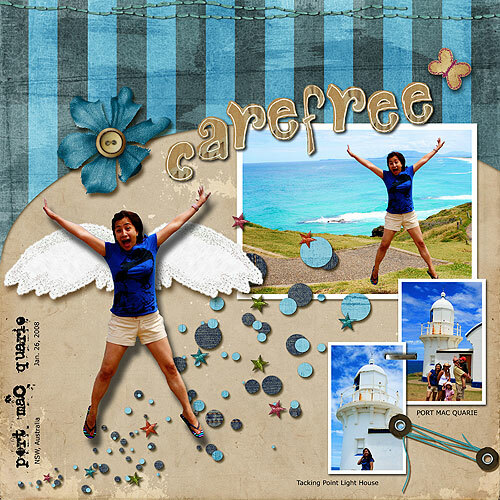 I have been into this hobby (digital scrapbooking) for almost two years now and I simply don't want to give it up. Anyway, eventhough I haven't done layouts lately, I still try to find time to download beautiful freebies from great designers out there that hopefully I can use when I have my mojo already. 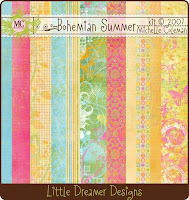 This is a cute Bohemian Summer Kit by Michelle Coleman and it is up for grabs on her blog. You can download it there. Hurry up before the link will expire ! 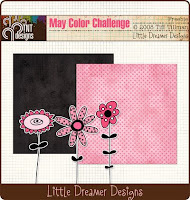 May Color Challenge sampler.